Bolt is kind of a forgotten movie…and it’s even fairly recent. I really liked the movie. Sure, the plot is pretty vanilla, but when Bolt curls up next to Penny in the fire…oh man…water works. There wasn’t too much food shown in the movie, especially too much that we haven’t already made. But check out our post for Bolt! Also, remember to check out our Patreon for some awesome perks! So Bolt and friends follow the Waffle World map and we see Waffle Worlds, but we never see an actual waffle. We see people eating burgers. That is a pretty common meal that doesn’t really need a recipe. So I decided to make a Waffle Burger! Mix flour, sugar, baking soda, baking powder, and salt. Cook in waffle iron, 1 ball at a time. Cook the burger as desired. Place between the waffle buns and enjoy! Will it make you Super Bark? 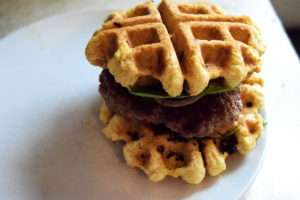 Having buttermilk waffles as a burger bun was amazing. I loved it so much.